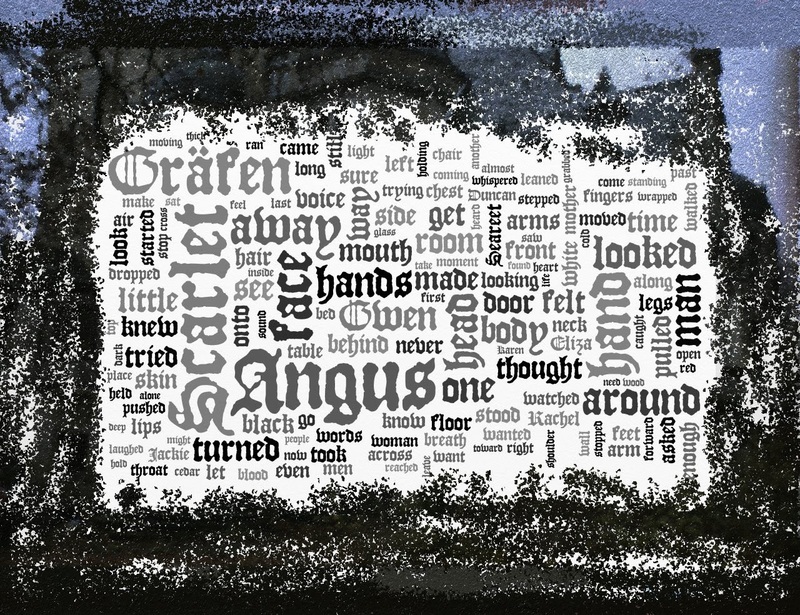 With Wordle, what you're hoping to create is a mini, visual synopsis of your novel. So character names should be prominent and so should some action words or items that work as symbols or important events in your story. Once you are happy with the words, use the font and colour tools to represent your genre. If you've written paranormal horror, you'll be selecting gothic style fonts and blacks, grays or eerie blues. See The Fergus She example below. The Fergus She is a Paranormal New Adult manuscript. 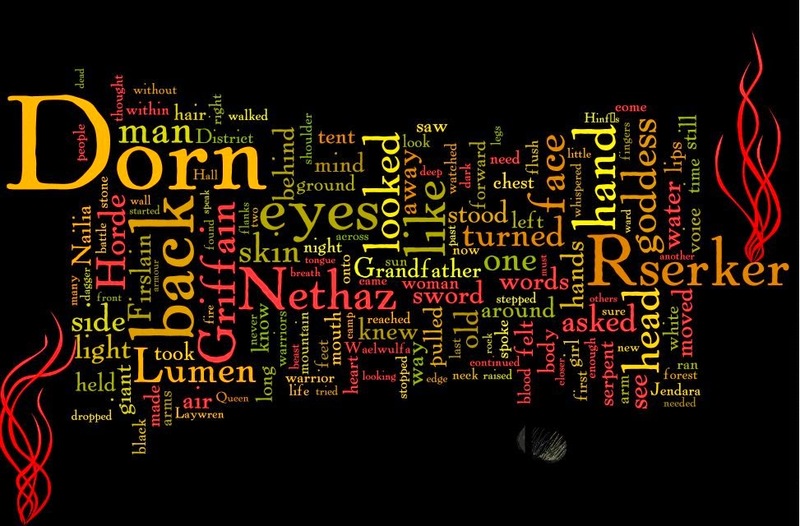 Rachel, the protagonist doesn't show up in this Wordle because my novel is written in Rachel's point of view. One way to jimmy the Wordle, is to add the word "Rachel" to the text multiple times--enough times to make her name a larger font than Angus. 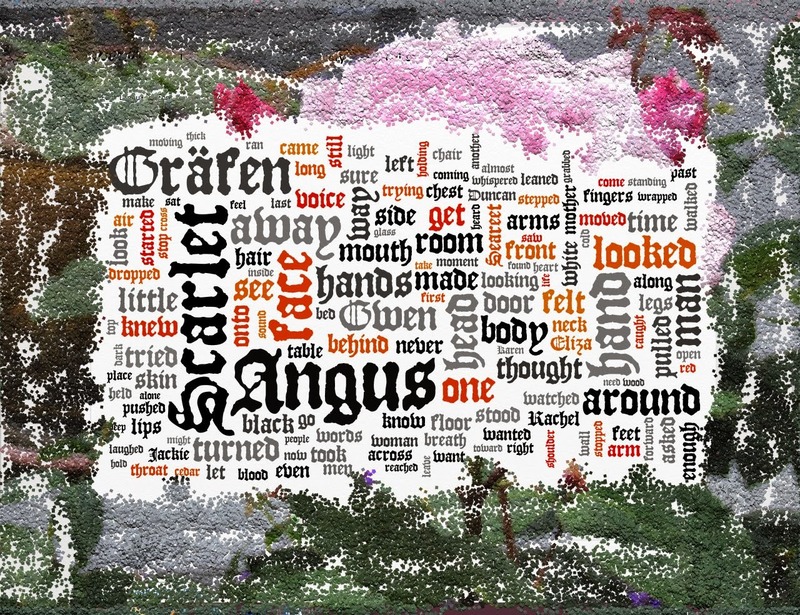 Angus, Scarlet and Grafen are all important to the text, being the lover, and villains. Next you can see many references to body parts, which is right on because there are a lot of sensual scenes in this novel. By changing a few colours in your Wordle, you can change the brand of your novel and target a completely different audience of readers. Therefore, it's important to make sure the font, colour and layout of your Wordle truly represents your novel's genre and plot. My next example is for my novel manuscript, The Precious Quest. This novel is a High Fantasy, but I've chosen earth colours as the story takes place in a dystopian world, which is turning to sand and dust under a merciless sun. The font I selected has a combination Roman/Celtic look, which I think matches the Anglo Saxon honour code of my protagonist's tribe. Dorn is the protagonist's lover, Rserker is her general, Nethaz is her warrior, and the goddess is her diety, but you won't see her name because again, this novel is written in first person. Notice the word "back" is almost as prominent as Dorn. I didn't take the time to remove it, but it should be removed to make this an effective branding tool. In all of the above examples, I took a screen shot of the Wordle (Cntrl + Prt Sc) and pasted it into a graphic editing program. That's where I added the grit framing The Fergus She examples and the flames in The Precious Quest. It probably took me about an hour or so to make the Wordles (mostly because it's fun) and now I have a few more branding items to use in my marketing of both novels to improve visibility and encourage readers.